John Austin is standing down from Erith & Thamesmead at the next General Election. It's supposedly a relatively safe seat but is anything safe for Labour now? The seat is one of eleven south London seats for which the Conservative Party will select as a group - as noted last week. "It is unlikely that there will be a General Election before late next year or 2010; in either case I will then be over 65, and 70 by the end of the next Parliament. At present I feel fit and well and I had thought of delaying a decision until I reach 65, but that would have been unfair on the Party and risk the possibility of being so close to an election that there might not be time for a full selection process if I chose to stand down then. Erith & Thamesmead is one of the most challenging constituencies with one of the highest levels of casework and whilst I feel fit, active and enthusiastic now, I am not sure that I will want to be working a 7 day, 70 hour week when I am 70." James Morris, Director of Localis and an occasional ConservativeHome contributor (see here and here) was adopted yesterday evening for the seat vacated by Nigel Hastilow. Mr Hastilow resigned after saying that Enoch Powell was partly right about immigration. James faces a projected Labour majority of 4,140. We wish him every success in overturning it. It has taken some time but R&S have readopted Mark Reckless today. Mark fought Bob Marshall-Andrews unsuccessfully at the last two elections but boundary changes mean that the seat now has a projected Conservative majority of 1,501. 10pm: We understand that the other finalists were Jacques Arnold, Dorothy Luckhurst and Katy Bourne. Mr Reckless won on the first round. "This is the most momentous Scottish by-election since Hillhead in 1982. The SNP’s greatest victory since the Hamilton by-election which put it on the map in 1967. And a result which has fought off very tough competition to be Gordon Brown’s worst setback yet. Westminster will want to know what this means for Gordon Brown. The question they should ask is what this means for Labour – and if there is such a thing as “rock bottom” for this party. Because tonight there just seems to be a vacuum, sucking up the Labour Party up very quickly. Yes, it was standing tall a year ago – but so was Bear Stearns. Labour looks like it may be heading the same way. As its National Policy Forum starts today, Labour should try very, very hard to envisage what its worst case scenario now looks like." "What I wonder is whether we can really put up with this for another 18 months. I think whenever people have had a chance to speak about this government whether at the local elections whether in Crewe, whether in Henley, whether in the London Mayor elections and now in Glasgow they’ve said look we think you’re failing and we want change. I think the PM should have is holiday but then I think we need an election. We need change in this country and that’s how change should come about." Following the decision to restart the Bournemouth West selection after one of the finalists was selected for another seat, the seat is now open again for applications. We don't have much information yet but it appears that the Bournemouth West selection is to be restarted. Mike Greene was due to face Rebecca Harris in an open primary on Thursday but then Rebecca Harris was adopted for Castle Point. Caroline Dineage had been named as Ms Harris' replacement but there were some concerns that Cllr Greene had an unfair headstart in campaigning for the primary. That unfairness could have been rectified by a delay to the open primary. The restart of the process suggests bigger issues. 8.15am, 8th July: We now understand that the process will begin again in September. Many factors appear to have contributed to the restart but unhappiness amongst some activists at the failure of a local councillor to progress contributed to some very destructive scrutiny of the candidates that did progress. Rebecca Harris today pipped Dominic Schofield to the post to win the selection for Castle Point, out of the shortlist of eight. Castle Point is a Conservative seat currently held by defector to UKIP Bob Spink MP. Rebecca Harris - who "worked in publishing, then later for the Conservative Research Department and as a special adviser helping to put together party policies on health, education and transport at the last election" - had been in the final for next week´s Bournemouth West final with Mike Greene. Scottish Tory Boy is reporting that Glasgow MSP Margaret Curran will be Labour's candidate in the Glasgow East by-election. This morning's Scotsman reports that all Labour MPs in Scotland and MSPs have been ordered to help defend a seat - the loss of which could spell the end of Gordon Brown. "The Conservatives won't come close to winning this by-election. But it presents an extraordinary opportunity to invite the nation's media to visit this archetypal Labour area and take that look around themselves - to see how Labour has betrayed the poorest in our society." Davena Rankin has already been adopted as our candidate. 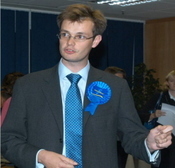 Dr Phillip Lee is a practising GP who has further degrees in Human Biology and Biological Anthropology and has been on the Conservative Party’s Priority List of Candidates since its inception in May 2006. He looks at the professional backgrounds of Conservative MPs and candidates and notes a worrying lack of those who have experience in the realms of science. Margaret Thatcher is rightly remembered for many things. Primarily, it is because she was the first female British Prime Minister. Of particular interest to me, however, and somewhat surprisingly, Mrs Thatcher was the first Prime Minister to hold a science degree. I stumbled across this piece of information whilst watching the ‘Thatcher Night’ on BBC 4 recently. Armed with this new fact, I thought it would be interesting to ascertain the academic backgrounds of present Conservative MPs and those of Parliamentary candidates. In view of the many successes of the Thatcher government, based in her own words upon a combination of those qualities needed for good scientific study, that of logic and instinct, the results of my brief review make for interesting reading. I should declare up front that I am a proud possessor of a few science degrees, and as a priority candidates list member from its inception, I undeniably have a vested interest in highlighting the absence of scientists on the Opposition benches and amongst our group of selected candidates! However, despite admitting to my naked ambition, I do genuinely believe that the absence of scientists from the Conservative Parliamentary party is far from ideal.